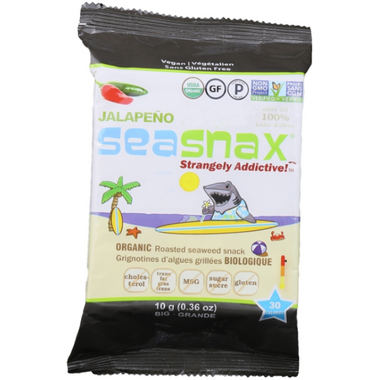 SeaSnax is a nutrient-packed roasted seaweed snack which is vegan, gluten free and Non-GMO Project verified. It is made with sustainably-grown organic seaweed, using 100% organic extra virgin olive oil and just a pinch of sea salt. This vegetable of the sea is all natural with no artificial colours, flavours or preservatives. SeaSnax tastes great right out of the bag - just rip'em up and chomp'em down! You might get hooked on SeaSnax - it's strangely addictive! These are a great low calorie snack if you are trying to beat the munchies. They are really really spicy (and I like spice!). The price is a little high for 10 calories of food IMO, but I will still try them again. Love this product! Very tasty, if you like the fishy type taste. It is very spicy too! These are great - only if you like spicy.